The MyMinnesotaWoods.com blog picked up a story about Stan Maleska, an Itasca County woodland owner, written by our friend Julie Miedtke (University of Minnesota Extention) for the September 2008 issue of the Itasca Woodlands newsletter. “Life’s Priorities:” A visit with Stan Maleska allows us to tag along with Julie and Stan as they walk his woods and talk about his life. It’s a heart-warming read. Seeing the Forest AND the Trees Study Tour participants spent most of the trip’s final day in a group process “huddle”, sorting through the new ideas, impressions and information we were exposed to during the tour’s seven hectic days. Before we got on the plane to return home, we wanted to identify the key elements of a shared post-tour action plan that addressed our overall study tour goals of 1) increasing the quality and value of Minnesota forests and forest products, 2) optimizing the balance of forest benefits, and 3) developing a shared vision for forest management in Minnesota including increased productivity. Each of the group’s six “Learning Track Teams” had developed a set of recommendations for possible inclusion in the plan – fourteen suggestions in all. For example, the Public Engagement Learning Track suggested a proposal to develop a demonstration project (community scale) for engaging private land owners. The Public Policy Learning Track presented, among others, a proposal to rationalize ownership of and intensify management of school and university trust lands. The Environmental Review and Permitting Learning Track brought forth an idea to develop a general permit for district heating facilities at the community scale, in order to remove procedural barriers to these systems in Minnesota. Blandin Foundation Program Officer Matt Rezac lead tour participants through a “dot voting” exercise to sort through all of the ideas surfaced by the Learning Track Teams. While all of the ideas had merit, and many of them are likely to find legs in the work and support of individual tour participants or ad hoc groups of participants, our goal was to agree upon a manageable “short list” of shared projects we could agree to support together. Matt asked participants to cast their votes through the filter of two key criteria: 1) was the idea something the group as a whole was uniquely positioned to accomplish, could not be done by any individual institution or organization; and 2) was the idea something the voter was personally willing to advance. Two rounds of “dot voting” and plenty of lively discussion about the process and criteria landed the group on five key recommendations. Presented below in DRAFT form, they are still very raw and subject to change and/or consolidation. Study tour participants are reorganizinig into Action Teams around each of the ideas. Foundation staff will be working with the teams over the coming weeks to translate the ideas into specific action plans. We are also working to produce a number of specific products, including a final report, video, and other communication and learning tools to help us all share our experience with others. 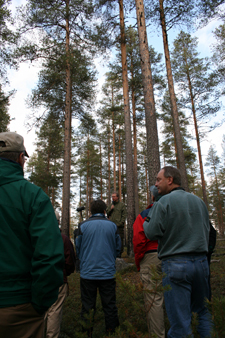 Our delegation of Seeing Forest AND the Trees study tour has now returned home safely from our eight-day whirlwind tour of forestry practices in Finland and Sweden. This post gives a snap shot of some of the highlights from our final day of counterpart meetings in Stockholm. Friday morning we were hosted at the American Embassy by Deputy Chief of Mission Robert Silverman who introduced us to Ambassador Michael Wood’s “One Big Thing” project . Launched in September 2006, the project aims to promote cooperation between the United States and Sweden to accomplish a breakthrough in alternative energy technology. Our goal was to learn more about possible opportunities for Minnesota’s forest products industry to benefit from the project’s focus on promoting public/private sector R&D and collaboration in this field. The U.S. Embassy staff welcomed our visit as an example of the kind of exchange of people, ideas and information they hope their “One Big Thing” project will help promote. Even the briefest introduction to Sweden’s economy makes it pretty plain why Ambassador Wood decided the United States has plenty to gain from Swedish bioenergy know-how. In 2005 the government of Sweden announced its intention to make Sweden the first country to break its dependence on petroleum, natural gas and other “fossil raw materials” by 2020, without building more nuclear power plants. According to the Swedish Energy Agency, today Sweden’s use of renewable energy sources has risen to 43 per cent, up from 30 percent in 1990. To achieve this progress, Sweden uses a combination of policy tools and market-based incentives. The national government sponsors innovative programs to promote the use of alternate fuels for everything from home heating to transportation. Many neighborhoods in Sweden use a central furnace that consumes biological fuels, instead of oil, to provide hot water for all of the nearby homes. (Earlier on the tour our delegation got a first-hand look at just such a member-owned “district heating facility” in a small community near Joensuu, Finland). Serendipitously, the same day our delegation was meeting with counterparts in Stockholm, back home in Grand Rapids folks from the Itasca Economic Development Corporation (IEDC) were teaming up with Minnesota’s BioBusiness Alliance to host over a dozen Swedish entrepreneurs and business representatives visiting our region as part of the BBA’s International BioEnergy Conference held in Mankato at the end of September. While we were learning about Swedish breakthroughs in alternative energy production and policy, the Swedish delegation in Grand Rapids was getting an eyeful of facilities in Itasca County, including the Rapids Energy Center, the recently closed Ainsworth Plant, and the Rajala Mill in Deer River. While we feasted on Swedish buns and coffee at the Embassy, the Swedes in Grand Rapids enjoyed a goulash breakfast in the “cook shack” at the Forest History Center. During our meeting at the US embassy a climate specialist from the Swedish Forest Agency gave us an overview of the forest bioenergy sector in Sweden, and the Director of the Federation of Swedish Forest Owners described her members’ interest in opportunities presented by the bioeconomy to use forest resources as a source of new income for family forest land owners. However, our delegation seemed most interested in the presentation by Jonas Rudberg, CEO of Chemrec, a Swedish company helping pulp and paper mills transform into biorefineries using a unique, proprietary black liquor gasification technology. Rudberg described a newly announced partnership between Chemrec and Ohio-based NewPage Corporation to explore the possible introduction of new technology at the NewPage paper mill in Escanaba, Michigan. The proposed new facility would employ Chemrec’s black liquor gasification technology to convert waste from the paper pulping process into synthesis gas. The synthesis gas can then be processed into a variety of biofuels. Chemrec estimates that this technology could enable the Escanaba mill to produce up to 13 million gallons of liquid biofuels per year. This new plant is a corner stone of Michigan Governor Jennifer Granholm’s efforts to position her state at the forefront of renewable next-generation fuels. Rudberg said that Chemrec officials had visited the Boise facility in International Falls during the company’s initial search for a North American facilities site, but ultimately negotiations had been unsuccessful, due to insufficient public-private financing options. Afterwards, conversation on the tour bus suggested that the Minnesota delegation was struck by the need for Minnesota to develop a state-wide forest bioenergy strategy. But more on that in our next post. Productivity Tour staffer Allison Rajala sends along this post after one very long and content-rich day that started in Finland and ended in Sweden. We were warned from Day One that Thursday would be intense — and it was! It began at dawn with a traditional Finnish breakfast of bread, cheese, porridge and coffee at the Mekrijarvi Research Station. Just like the University of Joensuu students and researchers stationed there, the night before we enjoyed a late night of traditional “smoke” saunas, very cold swims and swapping stories in the dorms, reminiscent of younger days. Despite a drizzly day, typical for October in Finland, UPM’s Finnish foresters generously escorted our hardy band through the deep woods of eastern Finland. Among our stops, we observed new technology developed by UPM field staff to clear brush around four-year-old planted spruce, how they thin to improve genetics and maximize value, and how they are researching the emerging practice of harvesting stumps–quite different from Minnesota and generating quite a buzz. Policy researcher and sociologist for the Finnish Environment Institute, Dr. Taru Peltola, helped us to experience forest community life. 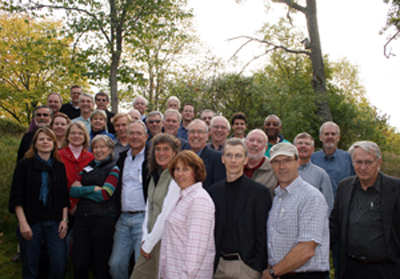 She introduced us to the staff of a local district heating facility–typical for rural Finland. These small, distributed heating facilities convert woody debris and roundwood to energy and symbolize the value of thriving forests to the rural landscape. Biomass energy is alive and well in Karjelia. Metla Institute in Joensuu was quite a place. Their top researchers shared breaking news surrounding global warming, the effects of Russian tariffs, wood technology and much more. One of the finest forest research institutions in the world, Metla also is home to one of the world’s most beautiful examples of architecture utilizing local wood resources. Two bus rides and two airplane rides later, we arrived safely at midnight in Stockholm’s historic old town for some much needed sleep after an 18-hour day. Wow! Thanks to UPM Blandin Paper Co’s Jim Marshall for sharing his musings from the Seeing the Forest AND the Tress Productivity Tour with VFVC Blog readers. As we flew over Finland’s famous Lake Saimaa on the way north from Helsinki, I knew our group was enjoying the spectacular view of water, autumn colors and the generous mix of forests and small farms below. I reflected on all the things our group had already accomplished in meetings with counterparts from the Finnish forestry sector, at the US Embassy in Helsinki, and in small informal discussions amongst ourselves. As the bus pulled away from the Joensuu airport, remarkably, we saw commercial thinning going on right out the bus windows. I began to get excited all over again, knowing that soon we would be out into the forest together, learning from local University experts about social and ecological aspects of the Finnish Forest “cluster” as well as hearing from my UPM colleague Matti Ylanne about the company’s methods for improving biodiversity on its forest harvest sites. Tomorrow we will be stopping to view mechanized cleaning, manual pre-commercial thinning, energy wood harvesting, and commercial thinning—an ambitious program for the morning drive on our way back to Joensuu. It is important for us to see and understand what is possible using intensive forestry methods. Here in Finland, we learned today, the history and culture drive landowners toward intensive silviculture (see Bernadine’s post below). The results are that a lot of timber is grown and harvested, fueling one of the worlds’ most impressive forest based economies. I’m looking forward to hearing what my fellow travelers see and think tomorrow. Today, Oct. 1, we found ourselves deep in the Patvinsuo forest exploring management tools, including fire, for productive forest systems. It struck me, more than ever, what a diverse range of perspectives, skills and experiences are represented among our hardy Minnesota band — it makes the learning that much more rich. 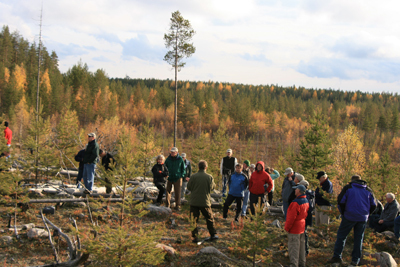 Our Finnish hosts, including sociologists, economists and ecologists, led far ranging discussions on the variety of impacts of forest management practices and ownership structures on all three “baskets” of forest values – social, cultural, and ecological. They pointed out that the mechanization of forestry over the past four decades — which saw ten chain-saw-wielding loggers replaced with a single machine operator — has had profound impact on employment and lifestyles in these remote rural communities. They also described the historical and cultural factors that have contributed to Finnish private land ownership patterns and attitudes. Half-way through our time here in Scandinavia, the learning is really beginning to gel around the learning themes we developed a year ago while touring the forests of Minnesota’s Aitkin County. Tomorrow we arrive in Sweden for yet another comparison. Then it’s time to pull it all together. Forest Biodiversity – a Key to an Uncertain Future? Yesterday afternoon we flew 440 km north from Helsinki to Joensuu, the self-proclaimed “forest capital” of Finland, and then took a bus another 70 km or so further north and east to Koli a national park and site to one of Finland’s best-known and most beloved landscapes. Our hosts said the view from the top of the two billion year old granite outcropping over Lake Pielinen inspired the composer Jean Sabelius and painter Eero Jarnefelt, and a host of other Finnish artists and photographers. Over dinner that evening, our host, Jari Kouki, previewed themes for today’s field trips. 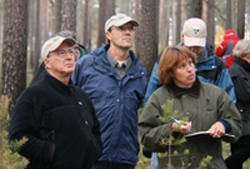 Jari is a Professor of Forest Ecology at the University of Joensuu with an interest in the dynamics of the boreal forest ecosystems with applications to conservation biology. Acknowledging the success of Finland’s world-leading pulp and paper industry, he nodded to the challenges ahead by cautioning that the past is not necessarily a guide for the future. One of the best strategies for preparing for an uncertain future, including climate change, is to protect forest biodiversity. To illustrate his point, Jari told about Finnish researchers who have been studying wood-decaying fungi. After examining over 100 species, one was found that extracts cellulose from lignum – a biological-based process that, if successfully applied in manufacturing, could replace mechanical or chemical processing. He said the researchers believed that using these fungi as a part of the pulping process could reduce by up to twenty per cent the energy consumption required. However, there’s a catch. These fungi are now endangered in Finland, because their habitat – old growth forests – is threatened. Hence, managing for biodiversity is a key strategy for ensuring a competitive future for the forest products industry. And managing for biodiversity also ensures that other forest values, such as eco-system services, will also be available for future generations.